Members of the #NotTooYoungToRun movement on Thursday stormed the Presidential Villa entrance in protest. The group which comprises Nigerian youths are demanding that President Muhammadu Buhari assent the Not Too Young To Run Bill when it is finally presented to him. The action of the protesting youths is coming a day after President Buhari withheld his assent to the amendment of the 2010 Electoral Act. 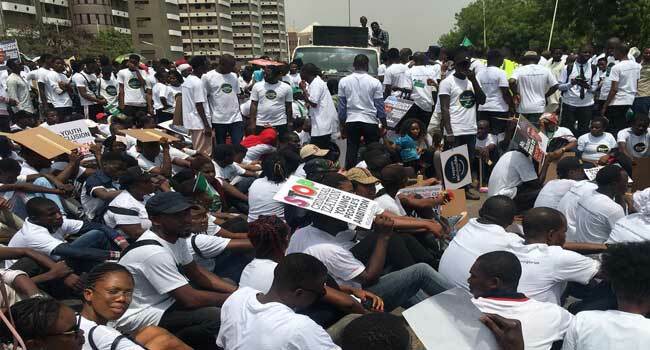 The aggrieved youths claimed that they have chosen to carry out the protest to guard against the possibility of refusal by the President to assent the bill which seeks to allow involvement of Nigerian youths in governance. Last year, the Senate passed the Not Too Young To Run Bill which seeks age reduction for elective officers in the country and allows youths an opportunity to contest for the office of the president at the age of 35 and governor or senator at the age of 30. 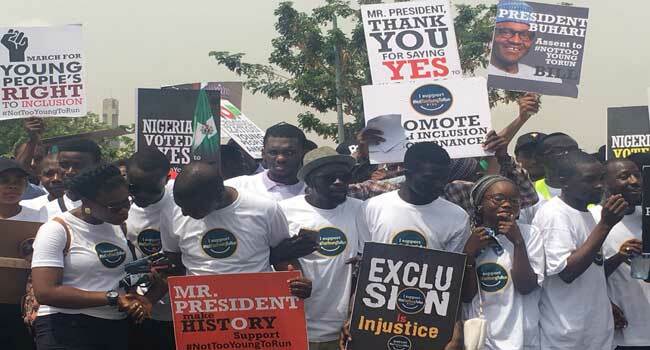 The protesters who converged in the Unity Fountain in Abuja on Wednesday morning thereafter marched to the entrance of the Presidential Villa bearing placards with various inscriptions. The youths barricaded the entrance to the presidential villa and rejected a delegate initially sent from the Presidential Villa to address them. The Senior Special Assistant to the President on New Media was sent to address the youths but they refused to give an audience. They insisted that a higher government official in the caliber of a Minister or the Secretary-General of the Federation be sent to address them. Minister of State for Aviation Hadi Sirika later addressed the youths and received their message on behalf of President Buhari. President Buhari had in his refusal to amend the Electoral Act on Wednesday wrote to the National Assembly. In the letter, which was read on the floor during plenary by the Senate President Bukola Saraki, Buhari said the amendments by the lawmakers were in conflict with existing laws. President Buhari said he is declining assent to the amendment of the Electoral Act because the amendment to the sequence of the election in section 25 of the Principal Act may infringe on the constitutionally guaranteed discretion of INEC to organise, undertake and supervise all elections provided in section 16(a) of the constitution.